Polling for the fifth phase of Uttar Pradesh assembly elections covering 49 seats spread over 13 district, including Bundelkhand region, began in Lucknow on Thursday. Fate of 829 candidates, including that of Leader of Opposition in the state assembly Shivpal Singh Yadav, BJP leader Uma Bharati and former UP chief minister Kalyan Singh would be decided by more than 1.56 crore electorates. 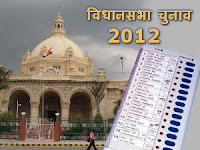 Polling for 49 seats in Firozabad, Kanshiram Nagar, Etah, Mainpuri, Etawah, Auraiya, Ramabainagar, Kanpur, Jalaun, Jhansi, Lalitpur, Hamirpur and Mahoba districts started at 7 AM amidst tight security, Chief Electoral officer Umesh Sinha said. The CEO said that polling was being held at 17,267 polling stations at 11,745 centres. While 2,104 stations have been identified as sensitive, 2,256 have been marked as hyper sensitive. To check any irregularity at polling stations 981 video cameras and 2,100 digital cameras have been installed, Sinha said. The fifth phase would cover assembly seats in backward Bundelkhand region, bastions of SP and former chief minister Kalyan Singh. In this phase, Shivpal Singh Yadav is seeking re-election from Jaswantnagar seat in Etawah district. Fate of firebrand leader Uma Bharati, who is making her debut in UP electoral politics, would be put to test from Charkhari seat in Mahoba district. Charisma and political strength of former UP chief minister Kalyan Singh would also be tested in this phase when elections would be held in his stronghold of Etah. While former minister and state president of BJP's women wing Premlata Katiyar is in the fray from Kalyanpur seat in Kanpur, a minister in BSP government Jaiveer Singh is contesting from Karhal seat. Among kin of political leaders, daughter of BSP state president and cabinet minister Swami Prasad Maurya, Sanghmitra Gautam is contesting from Aliganj seat in Etah district. Similarly, Shikha Mishra, wife of former health minister Anant Kumar Mishra alias Antu Mishra, who resigned following the NRHM scam, is in the fray from Maharajpur seat in Kanpur district. Like previous four phases the Election Commission expects higher turnout of electorates as compared to 47.57 per cent in 2007 polls. In last assembly elections in 2007 there were 53 seats in fifth phase of which BSP won 27, SP 14, BJP 6, Congress 4 and others 2. This time polling would be held in two new districts Kanshiram Nagar and Ramabai Nagar.